In order to debug some Zabbix problems here are some tools I gathered to help. Installation of the package zabbix-agent in the monitored hosts. – And use the same commands below inside your scripts to get this information required from the monitored hosts. # Note: this test configuration will get input from filebeat and output into a log file which can be watched with tail -f ….. Note: Typing by hand below is shown in bold. The following URL seems to have found some similar problems but because of lack of time I haven’t figured it out yet. X-Pack is an Elastic Stack extension that bundles security, alerting, monitoring, reporting, machine learning, and graph capabilities into one easy-to-install package. X-Pack also provides a monitoring UI for Logstash. Elastic search should be able to run anyway but might be limited in performance and may have other issues because of these limitations. There is no known remedies to this for Strato VM servers. [WARN ][i.n.u.i.MacAddressUtil ] Failed to find a usable hardware address from the network interfaces; using random bytes: ……..
No need to worry, the accuracy of the MAC address is not so important in this installation. If this problem occurs elasticsearch will start but not get initialised properly and most likely not function properly. security manager nor to system call filters. 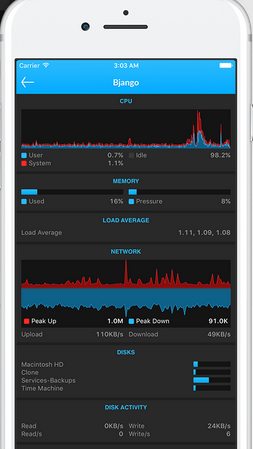 Although Apple doesn’t have too many apps that support Linux admins, here is one that just came back on the market with a rebound on 26 Oct. 2016 with a new look, features and bug fixes: The iStat3 Server for Linux and iStat3 for iOS made by Bjango PTY Ltd. This app will display live the following characteristics of a Linux server. In order for the iOS app to get this information from the Linux servers, it needs a connection to its colleague the iStat3 server, which is an agent running in each targeted Linux server. The agent is a daemon which runs in the background and listens on a standard port 5109(configurable). Since there are so many different Linux distributions the agent needs to be compiled in each targeted Linux server. In order to facilitate this process I wrote this article. Here you mostly need to modify the 5 digit server_code. Make sure the environment file exists, even if it’s empty, otherwise the service will not want to start!! Makes sure your firewall is allowing in the port 5109(or whatever the port you are using). Concerning the iOS app, you need to buy it on Apple store and its name is: iStat 3 from Bjango PTY Ltd. This app allows to monitor multiple Linux servers with very pretty graphs. If you have a Mac you can also buy the similar APP called iStat from Apple Store. It displays the exact same thing as with iPad and adds a few small extra features. Teamviewer is a very good and stable remote desktop with many clients software form almost any platform. Here I explain how I got TeamViewer to run on a headless Debian Wheezy server. Note: this above VNC server will not be directly conecte to via VNC as remote desktop here, but as an Xserver based virtual desktop screen for TeamViewer server to mirror it to TeamViewer clients. At start we will need the VNC connection to the first time start of TeamViewer. Afterwards no more. Therefore the port 5901 should be afterwards blocked by a Firewall. I came across a situation where I needed to send an HTTP request using the POST method with some POST data but after I have authenticated with name and password. The trick here is to preserve the SESSIONID of the authenticated response for the second POST request. I needed to go into my account in domain-hoster.net and request the CSV file which lists all my registered domains. In the above example I simulate a Firefox Browser (–user-agent), save the cookies (includes the SESSIONID) in the file cookies.txt and use it in my second POST request to get the content of the requested CSV file into the terminal. IMPORTANT NOTE: The password must be in proper HTML-encoded format to be accepted. This is applicable for any chars. that is not a-z or A-Z. There are many ways to convert the password in HTML-Encoded format. The most reliable way I found, is to manually login with a proper browser with name and password and look at the request headers using a browser plugin that lets you see the headers contents. The password will then be shown properly in the header. So a password like: Tw&Ui8vH!